The opening of a new Hindu temple in Glasgow will be marked with five days of "great pomp and show". The temple, in the city's west end officially opens on Wednesday evening and celebrations will run until Sunday. Organisers said people from all over the globe including devotees, high priests, scholars and religious leaders will attend the event. According to the tradition this type of event comes once in a lifetime and it is good fortune to participate in it. 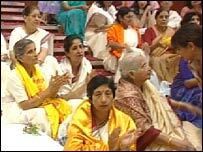 The temple, located in La Belle Place, is said to be the largest venue for Hindus across Scotland. Organisers said it would become a hub of learning - providing outreach activities for schools and community groups. Shobha Nagpal, the vice-president of the temple, praised the community spirit which helped to make the project a success. She told BBC Scotland: "Everyone has worked very hard and basically we run this temple on a voluntary basis. "We don't get grants or anything like that. People have pledged money and donated money with great enthusiasm to get this project going. "We are all proud of this magnificent building."